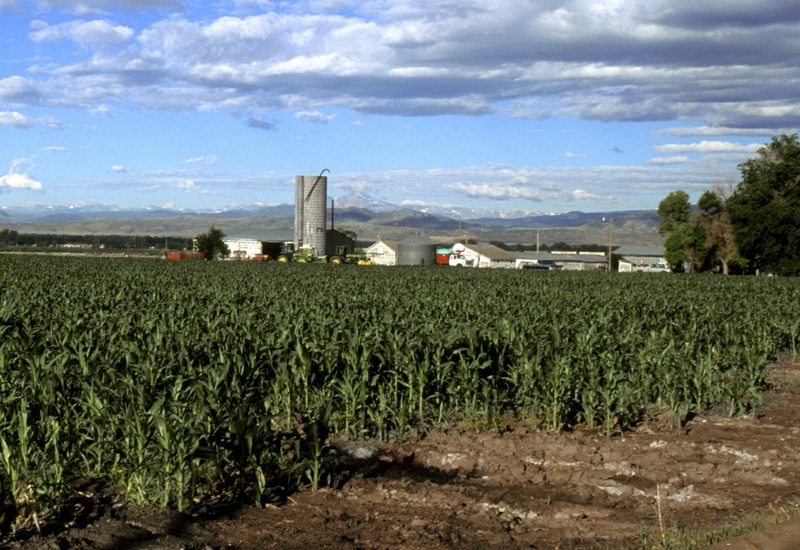 Modern farming practices are often blamed for the rise in greenhouse gas emissions. A new big data analysis indicates change in land use might be as much to blame. With an eye to best practices, researchers see solutions to mitigate these contributors to climate change. From methane emissions to nitrate leaching, Big Agriculture is often vilified for practices contributing to rising greenhouse gas (GHG) emissions. But based on a large-scale historical analysis of land management practices, scientists now see farming as part of the climate change solution. Scientists recently completed an analaysis of all land-use management practices, soil, and climate data since 1870 for the Great Plains region of the US. Results indicate land use shifts contribute to greenhouse gas emissions and that best practices adoption could significantly mitigate these emissions. Courtesy Scott Bayer/USDA. Using the DayCent ecosystem modeler on a 300-node computing cluster at Colorado State University, researchers combined comprehensive agricultural practices data with county-level historical soil and weather data from 12 Great Plains states from Texas to North Dakota. The US Environmental Protection Agency currently uses DayCent to do year-to-year soil carbon and nitrous oxide assessments. Parton, who has a background in computer modeling, has been partnering for the last 15 years with agriculture historian Myron Gutmann, professor of history and director of the Institute of Behavioral Science at the University of Colorado, Boulder. Together, they offer the first complete big data perspective measuring cumulative GHG fluxes caused by all agricultural sources. Their results are published in the Proceedings of the National Academy of the Sciences. The Great Plains region holds more than 30% of the US agricultural land area, producing more than 50% of winter wheat and more than 30% of beef production in the country. Parton and Gutmann divided 476 Great Plains counties into local regions to create 21 schedule files, and then interpolated them to the entire 12-state region. They then compared land management practices against 11,000 input variables, such as soil temperatures, tractor fuel consumption, irrigation energy efficiency ratios, and seasonal precipitation. This resulted in 477 datasets that now reside in a publically accessible database at the Inter-university Consortium for Political and Social Research. 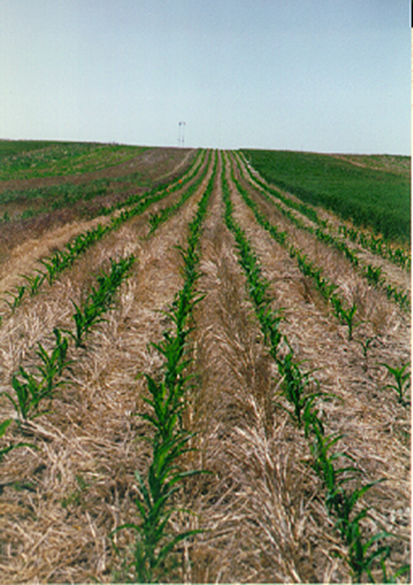 A recent big data analysis points to no-till farming (shown above) as an example of one of the best practices that could mitigate green house gas emissions in the Great Plains. Courtesy Gary Peterson. Parton’s study shows that, spurred by shifts in technology and government policy, Great Plains farming practices went though many changes in the last 145 years. Cattle grazing supplanted the native bison and dominated Great Plains land management practice after the US Civil War. Accelerated by the Homestead Act of 1862 that gave land freely to those willing to cultivate it, a great plow-out followed until 1930. The third and ongoing wave of change came next when technological advances such as machines, fertilizers, pesticides, irrigation, and high yield crop hybrids remade the practice of farming. Cattle production has also increased during this last period. This broad perspective yields valuable insights, and scientists now see that GHG flux is as much a product of change in land use as any particular farming practice. For example, a shift to irrigation and fertilizer application will enhance soil carbon storage, yet overall GHG emissions will increase through resulting nitrous oxide release. This historical view also points to the potential for GHG mitigation. By implementing no-till or reduced tillage practices, adopting slow-release fertilizers, and inoculating cattle, Parton’s study predicts a 50% reduction in nitrous oxide emissions, 30% decrease in methane emissions, and an additional storage of 50 grams of carbon per meter per year. Farmers can measure their progress toward these goals through COMET-Farm, a free carbon and GHG accounting system Parton developed in partnership with the USDA's National Resources Conservation Service. --iSGTW is becoming the Science Node. Watch for our new branding and website this September.